One day I was being super lazy; I wanted to cook my entire meal in the oven…I already had the rice prepped and ready to go, tofu was marinating and waiting to get trayed and popped into the oven. What about some carrots to go with? I just wanted to be sure on temps and times so I googled Roasted Carrots and came up with Ina Garten’s Roasted Carrots. They were fabulous! I snuck in some Snap Peas that I had hanging around in the fridge which crisped up like crazy…it was like eating chips! 12 Carrots, scrubbed; if thick, cut in half, lengthwise. Cover baking tray with aluminum foil or parchment paper for easy clean up. Slice carrots diagonally in 1 1/2 inch thick slices – they will shrink while roasting so be generous. Toss them in a bowl, to coat, with the olive oil, salt and pepper. Turn out, in a single layer, onto prepared baking tray. Roast in oven for 20 minutes, until lightly browned and tender. Sprinkle with chopped fresh herbs, if using. I had made some Baked Brown Rice a few days ago and left with quite a bit leftover; had a scour through the fridge to see what I could make using the rice. 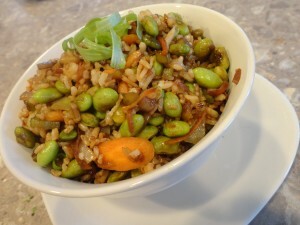 hmmm…let’s see: celery, onions, carrots, edamame…Fried Rice! Minus the typical fish sauce and eggs you find in most Fried Rice offerings. Yum! In a small bowl or a measuring cup combine soy sauce, sesame oil and ground pepper; set aside. In large (12″ or 30cm) deep skillet, heat olive oil over med-high heat. Add onions and cook for about 3 minutes. Increase heat slightly and add minced garlic, ginger, celery, carrot and cook for about 3 minutes, stirring constantly. 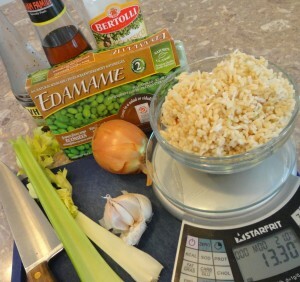 Add rice, the soy sauce mixture and edamame; stir constantly until heated through. If desired, garnish with a sprinkle of sesame seeds and a bit of sliced green onion. We don’t eat a lot of rice around here and it used to be that we always had Jasmine or Basmati rice but have recently switched to brown rice. Admittedly I used to be one of the worst rice cookers in the world; it was either burned onto the bottom of the pot…the cure for which is to pop popcorn in said pot and it miraculously comes clean…or it was undercooked and swimming in icky water. And yes, I had read the instructions on the packages of purchased rice but it refused to cook up nicely for me! Then one day I just decided that I simply HAD to learn how to cook the stuff. I did a search on cooking rice, read cookbooks and then headed to the kitchen armed with my newfound knowledge. Determined to cook a perfect pot of rice, I measured the rice, measured the water and dumped out a 1/4cup, put the pot on high heat, brought it a boil, added a teaspoon or so of butter, some salt and pepper, put a lid on it…slightly ajar, reduced heat to a simmer, waited for the boil to settle to a simmer, put lid on tightly and walked away for 17 minutes. Voila, a perfect pot of rice! What has this got to do with Baked Brown Rice? Well, once I started cooking brown rice I ran into all my old problems! Bah! Brown Rice! Why does it have to be better for you than white rice? Sigh. One weekend I had all the grandsons and two extra dogs underfoot and I needed to put a meal together that would cook itself, so to speak. Absolutely no time to babysit a cantankerous pot of rice! I happened to be making baked chicken and then it struck me, my grandmother used to bake rice all the time! I googled baking brown rice which lead me to How to Make Perfect Baked Brown Rice at In the Kitchen with KP; easy to follow directions and an hour later I was serving up Perfect Oven Baked Brown Rice! Preheat oven to 375F. – if baking dish is pyrex, lower temperature to 350F. Boil water in kettle, measure into large measuring cup; add vegetable stock cube and extra virgin olive oil, stirring well to dissolved vegetable stock cube. Add salt and garlic powder; stir. Pour seasoned water into prepared baking dish. Add rice, stir to combine. Bake on the middle rack of oven for 60 minutes. 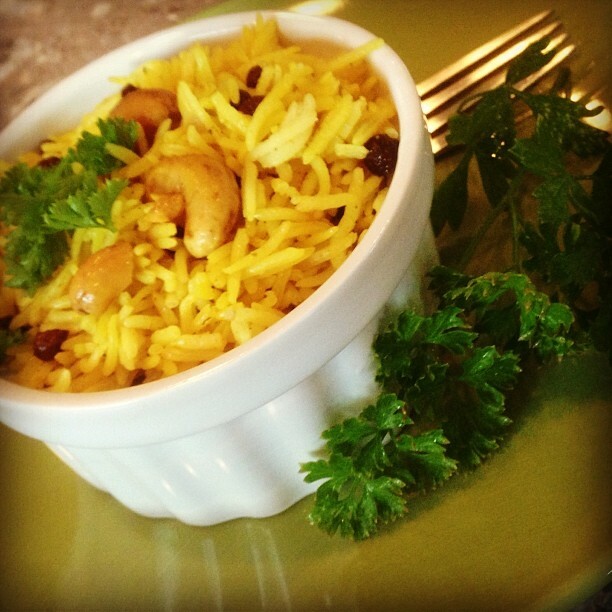 Remove from oven, uncover and fluff rice with fork; serve immediately. So it is interesting to cook around here; I am a Vegetarian and have been for the past 33 years so no, I am not about to start eating meat…no, not even a lil bit! However, my husband of 13 years is NOT a Vegetarian. For the first 10 years that we were together I continued cooking Vegetarian meals; he didn’t complain. Oh wait, he had been eating his own cooking for a number of years…he was probably just happy to have someone cook for him! Two years ago he tried Atkins which meant A LOT of meat! Once Luke started eating meat again he confessed that he didn’t really like vegetables and particularly cauliflower. He conceded that this recipe for Roasted Cauliflower that I found over at Simply Recipes was the best yet….next to Frosted Cauliflower…which I think he likes because it is slathered in a cheesy sauce. This Roasted Cauliflower is plain, simple and tastes oh, so good. 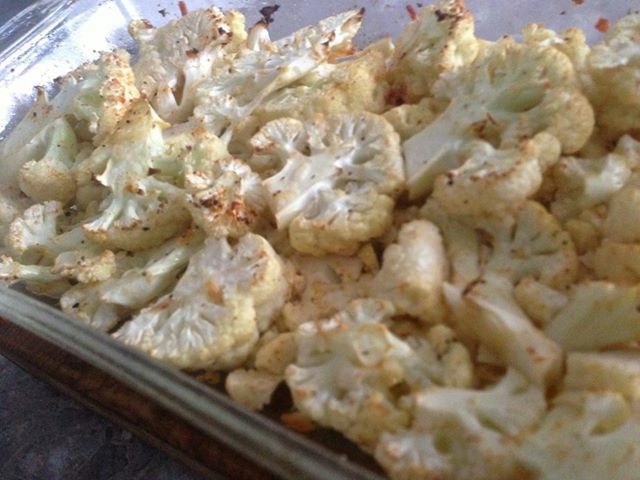 Cut cauliflower into florets and put in a single layer in an oven-proof baking dish. Sprinkle lemon juice over cauliflower and drizzle each piece with olive oil. If the oven hasn’t reached 400F. yet, set aside until it has. Place casserole in the hot oven, uncovered and bake for 25-30 minutes, or until the top is lightly brown. Test with a fork for desired doneness. Fork tines should be able to easily pierce the cauliflower. Remove from oven and sprinkle generously with Parmesan cheese. This recipe came through my Facebook feed from Budget Bytes the other day and I thought I might have all the ingredients in my pantry; only had to make a few substitutions and have another on deck for the next time I make this. Now maybe my pilaf fell a little flat because I used Basmati rice instead of Jasmine but I am more likely to have Basmati rice in the pantry over Jasmine so I will just make that work by adding a McCormick’s Vegetable Stock cube the next time I make it. Also, try as I might, I simply cannot grown a kitchen herb garden! Every time I buy fresh cilantro it goes off before I have a chance to use it so I just left it out. I threw in a bit of fresh chopped parsley (Because who can’t grow that stuff!?) which added lovely colour but not a whole lot of flavour. In a medium saucepan heat oil over medium heat. Cook onion for 2 minutes then stir in minced garlic, turmeric, cumin and cinnamon and continue cooking for another 2 minutes, stirring often. Add the rice, turn the heat up a notch; cook, stirring constantly for 2 minutes. Add the cashews, currants, water, vegetable stock cube, salt and bay leaf; stir to combine. Turn the heat all the way up and bring the pot to a boil; reduce the heat as soon as it comes to a full boil, put the lid on and turn the heat down to low and simmer for 20 minutes. Remove from heat and allow to sit for 15 minutes, with lid on. Remove lid, fluff the rice with a fork. Gently stir in chopped cilantro.